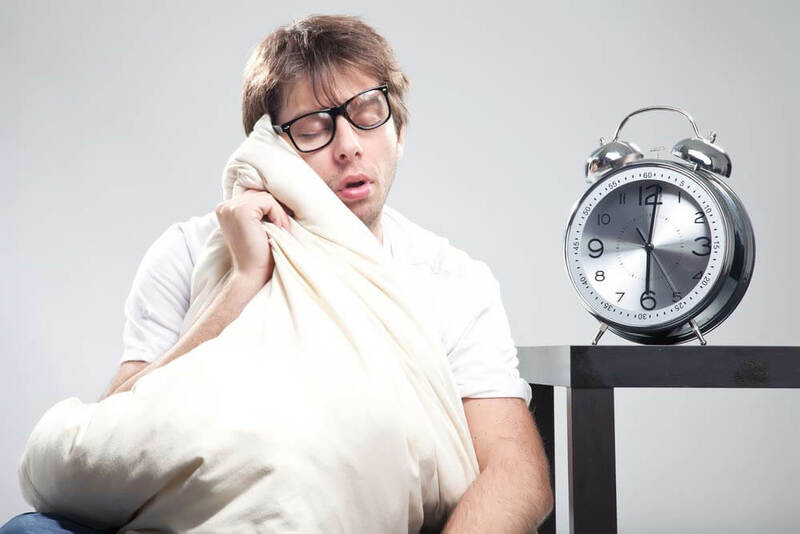 According to the Sleep Health Foundation, at least one in three people struggles with insomnia, and a large fraction of this insomnia is owed to poor sleep habits and other controllable factors. Even people who schedule a full eight hours and go through all the motions of getting a good night of sleep are still groggy. All of the factors below may be preventing you from feeling well rested. Many doctors whose patients complain they are tired respond that one hour of sleep before midnight is like two hours of sleep after. That is, people are designed to sleep long before midnight, and though we modify our hours of wakefulness with manufactured sources of light, humans’ relationship with sunlight and the 24-hour clock is still in place. The brain releases chemicals necessary for wakefulness and good health only up until about 2:00 AM, for example, but only does so when it is asleep. Though it may seem counterintuitive, spending less time in bed may mean better sleep. This is because reading, exercising, and watching TV in bed communicates to the body that the bed is not just a place for sleep. If you suffer from insomnia, make a commitment not to spend time in bed unless the objective is to sleep. Scientists in the last twenty years have discovered that humanity takes its cues for when to stay awake and when to release sleep hormones in part from the color of light. Before the invention of candles and light bulbs, humans awoke to sunlight. Light available during the day was blue, and the orange light of sunsets prompted humans to prepare for sleep. Though our lifestyles have changed, this subconscious response to light has not. Savvy restaurants can purposely use blue light to keep patrons lively, engaged, and willing to stay and order more food than they would with more orange lights. 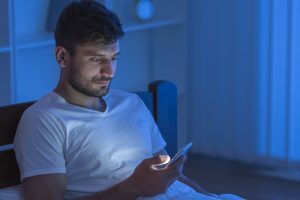 The issue many Americans encounter is that phone, computer, and TV screens all emit blue light, and this lulls their bodies into a false sense that it is still daytime, even late at night. To combat this, try an app like Flux, which gradually removes the blue tint from screens as it gets closer to the user’s stated bedtime. Others who have trouble winding down for the night sometimes use orange-tinted glasses at night to remove blue light stimulation. Beyond the point of initially falling asleep, the light continues to play a role in patterns of restfulness. Namely, no light means better sleep. This is partially due to humanity’s long history of rising with the sun, but it also occurs because humans sleep in cycles. Every ninety minutes on average, the human body goes through a sleep cycle, covering five different stages of sleep, both REM (rapid eye movement sleep) and NREM (non-rapid eye movement sleep). This information is important because it is not equally easy to wake a slumbering person across all five stages. While it is simple to rouse a person from sleep stages one and two, stages three and four are deeper and cause more disorientation and grogginess when disrupted. When people reach the end of dream-inducing REM sleep, the last of the five stages and arguably the most important, and then the cycle repeats. This means that a sleeping person essentially wakes up every hour and a half. Ideally, the sleep cycle resumes automatically, and the human brain forgets this period of wakefulness because it is asleep again within five minutes. If it is distracted by stimulants like light, noise, or any form of discomfort, however, sleep is delayed. Another important detail to consider is the color of any lights illuminating the bedroom overnight. Is the light from that clock in the corner a sunset orange, or a midday blue? Especially if it gives off blue light, covering it up can mean better sleep. Although most consumers associate the effects of coffee with energy in the morning and the inevitable crash in the afternoon, caffeine stays in the human body for as much as twelve or more hours. Consumed as many as six hours before bedtime, caffeine tends to impair sleep in such a way that one quality hour of sleep is lost. If someone is drinking six cups of black tea a day, waking up groggy, and taking in more caffeine, as many Americans do, that will impact the quality of their sleep. Stimulants require mounting doses to provide the same effect, like other psychoactive substances, so those who frequently drink coffee, tea, or energy drinks and find themselves at a loss for energy should consider cutting back their dosage. 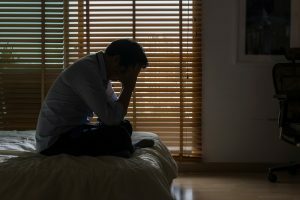 It happens at the worst times– A man worrying about his performance in court tomorrow, his family, or making a difficult decision finds himself wide awake during his only opportunity for some shut-eye. Even worse is the reality that the longer he lies in bed awake, the more he is training his body to lie there without sleeping. If this happens to you, get out of bed. Walk around in low light for several minutes, or make (herbal, caffeine-free) tea and read part of a book. Preventative measures for further sleepless nights include yoga, which can be accessed for free in the form of videos that often cater specifically to the sleepless, and meditation. Exercising regularly in the morning or early afternoon can also help regulate the flow of energy according to a healthy 24-hour schedule. Dogs, traffic, and children are all unavoidable sources of noise, especially if you live next to a busy road, or your neighbor refuses to train Fido. In any of these cases, a noisemaker could help you. It may sound counterintuitive to combat the issue of disruptive noise with more noise, but many who use noisemakers to ensure a solid night of sleep would never go back to their life without one. These products provide a constant wall of white noise that effectively blocks outside disturbances, and function as a highly desirable, lower maintenance, and less waxy alternative to earplugs. If none of these issues seems to be causing your insomnia, or you have no problem falling and staying asleep all night but still need more energy, it is best to contact a doctor. Doctors who specialize in sleep can observe your brain waves and behavior throughout the course of a night and either recommend further courses of action, suggest different sleep habits and tips for better sleep, or diagnose sleeping disorders like sleep apnea.